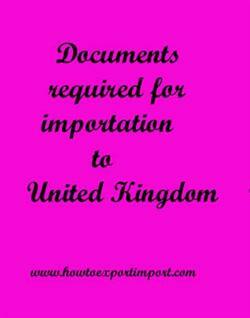 What are the documentation procedures as an importer in UK? What is the certification process to import to UK? Types of documents required in UK to import goods? Information provided here describes about documents required by each import in UK which need to be submitted with customs officials for the clearance process. Normally, Goods from European Union (EU) countries can be brought into the UK with minimal paperwork, though it's good practice to ask your supplier to send a copy of the invoice with the goods. In very rare cases, where you have supplied no import or export declarations, you must complete an Entry Summary Declaration or an Exit Summary Declaration. The imports from outside the EU, generally need an invoice and a copy of the transport documentation, such as a Bill of Lading, for customs clearance. This post explains about various documents at different levels that required by every importer need to be submitted with the UK Customs Authority in order to obtain clearance of the consignment and subsequently move it out of the port of UK Customs. Import documentation in Birmingham port customs. What are the documents required to import in Bournemouth. What are the import document processes need to carried out with Bristol customs. Required documents to import in Cardiff port. Customs documentation requirements to import at Doncaster/Sheffield port. Documents required to submit with Middlesbrough customs for importation. Documentation procedures for import at Nottingham/Leicester customs. What are the documents need to be submitted to import at Exeter port customs. Which documents should I provide at Leeds/Bradford customs port location for import. Documents need to move cargo out of customs at Liverpool port customs location.